Part of our job entails keeping on top of culinary innovations around the world, to see might be interesting for the home cook. While a soup-topped salad may not sound like an innovation, we don’t come across it often. Usually it’s in the form of a small vegetable garnish. 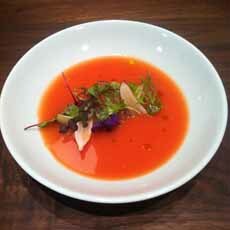 Today’s tip was inspired by Botanica, a new vegetarian-focused restaurant in Los Angeles (photo #3). 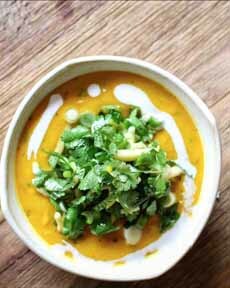 Take your favorite chunky soup and add the salad on top, lightly dressed with oil plus vinegar, lemon, lime or orange juice. Whatever you like, as long as its lightweight. Tomatoes or anything heavy will sink, and only work with a very shallow bowl of soup. Leave off the other logical contenders—broccoli florets, cheese, pepitas, e.g., and make this topping about the salad. The history of soup is almost as old as the history of cooking. First: discover fire. You can place raw food over flames or on the hot embers. Then, invent a vessel in which to cook a liquid. Add water to the container, toss in whatever vegetables you’ve foraged, cook it over the fire, and voilà, soup: a hot, nutritious meal. The first containers for cooking over the fire were cleaned out animal hides. By the Neolithic era, rough pottery had appeared; but the pots could not withstand the direct heat of the fire. Instead, heated stones were tossed in to raise the temperature of the water and cook the food. The round shape enabled the flames to curl up around the sides, so the food cooked faster. The level of heat was controlled by how close to the fire the pot was placed. Food could be boiled rapidly over a high fire or simmered slowly in the hot ashes at the edge of the hearth. Here’s more on the evolution in cookware. Even in the evolved Greco-Roman times, travelers could not be certain of finding food. All travelers, including soldiers, had to carry their own dried ingredients to boiled into soups. Biscotti—twice-baked, dry rusks,—were invented in Roman times to add convenience and variety to the on-the-road fare. The very concept of the modern restaurant is based on soup. Restoratifs—meaning something that restores health, strength or a feeling of well-being, and in this case a hearty bowl of soup, is the basis of “restaurant.” Public restaurants with tables and menus first emerged in 18th century Paris, adding to the choice of fare from food stands and public markets. The word soup is itself the basis for supper, and the verb “to sup.” Soup derives from the post-classical Latin verb suppare, to soak in a liquid. A nice garnish, but hardly a salad. Here’s the recipe from Sunset magazine. 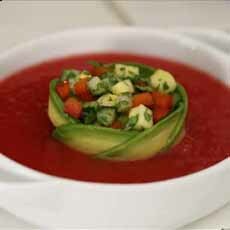 Clear gazpacho topped with salad, a twist from the creative chef Scott Conant. Go big or go home with those greens: a “real” salad atop the soup at Botanica Restaurant in LA. Everything on the menu is equally wonderful. This handsome labor of love is from Apples And Butter. Here’s the recipe. Soup was the evening meal of the less affluent, who poured broth onto yesterday’s bread (the ancestor of modern soup croutons) and added whatever else they had. 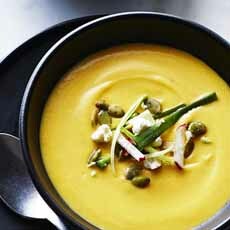 Soup evolved into the categories of soup we know today (the chef Escoffier was first to categorized all French soups). The 19th century saw portable soups: canned or dehydrated, soups. These supplied cowboy chuck wagons, the military, wagon trains and other travelers, as well as the home pantry. The late 20th century brought us microwave-ready soup in disposable containers. One can only guess what science will produce going forward. Whatever it is, it needs a garnish! Also check out the different types of soup in our Soup Glossary.